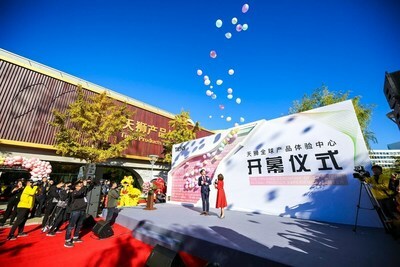 TIANJIN, China, Nov. 12, 2018 /PRNewswire/ — Leading healthcare company, TIENS Group, has announced their global expansion into the new retail market with the opening of a new flagship TIENS Experience Store in China. Located in the TIENS International Health Industrial Park, the new store features a combination of online and offline consumer experiences through a technology-enhanced approach to new retail business and marketing. PointsWin, Tiens’ brand new e-wallet app plays a core role to connect the blockchain-based customer network. Consumers can use the app to make purchases and earn rewards at any business bearing the TIENS banner. These innovations as a circle are enabling a merger of online and offline retail that the Group has sought to harness through a growing international presence. TIENS is establishing 110 branches worldwide and the new store will be the icon of the Group’s “One Body, Multiple Wings” strategy globally. This includes developing a diverse, integrated healthcare ecosystem spanning physical retail, e-commerce, TCM and medical facilities, as well as educational, tourism, hotel and lifestyle experiences. “We have always approached development by considering the world from a global perspective,” said TIENS Group Chairman Li Jinyuan. “These are especially the regions involved in China’s One Belt One Road initiative,” he added, noting that a majority of TIENS worldwide branches fall within this zone. The flagship store will focus on an experience-driven approach to marketing by offering an immersive environment in which customers can explore and discover original health and beauty products. Through in-depth, immersive customer experiences, this latest development is helping the group transform the concept of brand consumption into a more personalized experience. “The TIENS Experience Store’s diverse layout is a concrete representation of the ‘One Body, Multiple Wings’ global strategy,” said Peggy Liu (Liu Yu), Director of the Group’s Experience Operations Department.